Life in Roman York wasn’t all Emperors and Empresses. What was life like day after day for the regular folk, both soldier and civilian, who lived right here nearly two thousand years ago? Find out as we walk in their footsteps. Where did they come from? What did they eat? Where did they live? How did they keep clean? And how, ultimately, were they laid to rest? 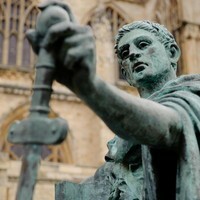 Along the way, we will explore what remains of York’s Roman past, visit the sites of harbours and bath-houses, and discover Roman sarcophagi. Combining research from archaeological investigations all over the city, alongside insights from objects in the York Museum’s collection, this trail will explore the hidden lives buried under nearly two millennia of history and bring to life some of the voices of Roman York’s past.